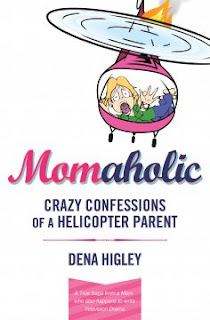 Momaholic: Crazy Confessions of a Helicopter Parent by Dena Higley details the true story of the author’s battle with helicopter parenting and life. Momaholic illustrates the real life struggles of an overworked, over stressed, working mother seeking the elusive dreams of perfection and “having it all”—until she nearly lost it all. Momaholic is a great eye opener for many mothers hovering over every aspect daily life—running the risk of a “crash”. Momaholic is not written as a “how-to” book on family life. Instead, it is Higley's “how not to” story. The book is filled with the author’s real life memories and experiences—ranging from painful events to faith filled realizations. Higley, previously the head writer for Days of our Lives—the long running daytime soap opera, held a powerful, stress filled job—while attempting to micromanage a “perfect” home and family. For the many of us frantically juggling too many hats and responsibilities to the point of insanity, self included, Higley’s frank, honest words in Momaholic set a new light on perfection and reality. While the book does jump about through various stages and scenes of Higley’s family life—the details of each chapter contribute nicely to the book’s overall theme and flow. Momaholic does not flow as a traditional story from beginning to end—there is a lot of revisiting and stories spanning the author’s life woven throughout the book. Life is not always neatly packaged for parents—moments build on all of our other life’s moments. Momaholic reminds helicopter parent that the helicopter flight did not begin minutes before the crash—it was hovering, and sputtering, for a long time before the inevitable crash. Momaholic is a wonderful book of confession, realization, and hope. While I am not ready to land my helicopter quite yet—I’m ready to save the engine and give it a few breaks every now and then. Momaholic is motivational and therapeutic in its own right for mothers struggling to be everything to everyone every minute. I would encourage my readers to devote some mom-time to Momaholic—even if the words “helicopter parents” are not in your vocabulary. Momaholic does not offer answers to dilemmas facing working parents. It does, however, remind moms that perfection has a lot to do with perception. Disclaimer: I was provided a complimentary copy of this book for review purposes through BookSneeze. I was not asked to provide a positive review—just an honest one. As always, my opinions are my own and are not influenced by the publisher or group offering the review. What a wonderful recommendation for parents! Too often we try to do it all and burn ourselves out while doing so. Another terrific one along the same vein is Full Cup, Thirsty Spirit by Karen Horneffer-Ginter, PhD. I am about half-way through it and find it very insightful and uplifting. I'll be reviewing it soon on my blog, My Bookshelf.